On the first Friday of each month the Interpreter will publish Digital Diplomacy links instead of the weekly Digital Asia links. As Australian digital diplomacy strives to catch up to the rest of the world, these links will highlight the most creative and effective ways in which countries are leveraging the Internet for foreign policy gain. The BBC has a fantastic radio documentary and magazine piece on the UK's leading digital diplomat Tom Fletcher (h/t @ukinaustralia). This critique of how US ambassadors attempt to influence online debates points to French Ambassador @GerardAraud as someone who 'does Twitter right'. Russia's game of trolls: how 'digi-kids' and anime is helping President Putin's fight for online supremacy. 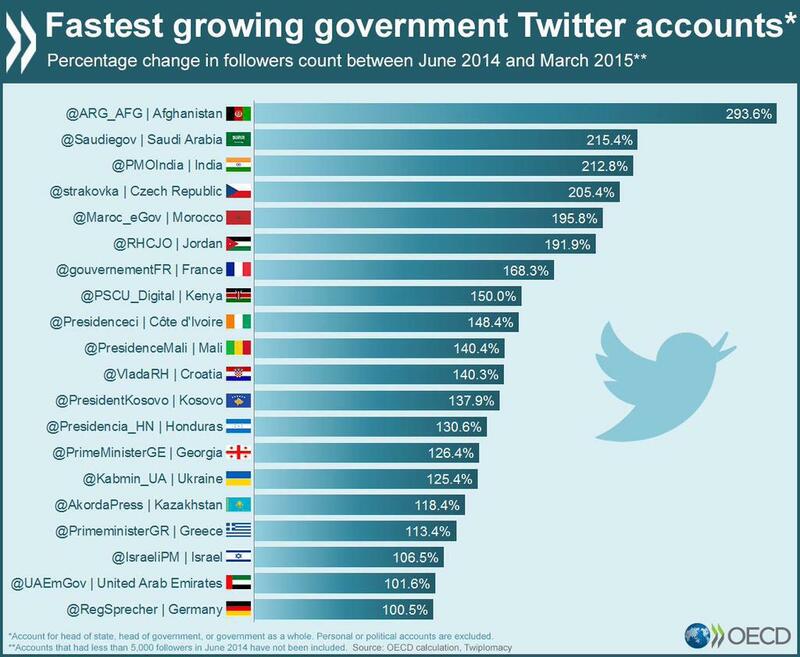 The fastest growing government Twitter accounts in the world hail from Afghanistan, Saudi Arabia and India. The office of Ukraine's President has tweeted detailed intelligence and nifty info-graphics of Russian troop movements and equipment in Ukraine. This journalist believes the information was sourced largely from signals intelligence. In order to be heard, pro-nuclear deal Iranians have joined together to create a 'grassroots' social media and YouTube campaign. How Uganda's High Commission in Rwanda is tapping into the power of social media and mobile chat apps. The new head of the UK's diplomatic service is on Twitter via @SMcDonaldFCO (as was his predecessor). It's worth mentioning Australia's equivalent, DFAT Secretary Peter Varghese, is not yet on Twitter (or any other online platform). However, he did touch on DFAT's use of social media – only one aspect to digital diplomacy – in this recent speech. A touching tribute to Dr Suniti Solomon, who is credited with waking up India to the threat of HIV and who recently passed away, was cross-posted on the blogs of USAID and the US State Department. A snapshot of how the Fijian Government – with a little help from India – is expanding its use of social media. The Digital Diplomacy coalition – a Washington group which began in 2012 with communication officers from embassies and think-tanks – has partnered with Google and is going global. The UK Government wants you to know what it's doing to 'destroy and dismantle' ISIS and it has launched a new Twitter account (@UKAgainst ISIL) to provide you with updates.